Generally speaking, the European settlers in North America coined the phrase 'Indian' or 'Red Indian' to describe the North American tribes they found while they were settling what is now the USA. To the north of this vast collection of varying regions and climates were the native settlements of what is now Canada, while to the south were the various peoples of modern Mexico, most especially the Aztecs. The Youghtanund were located on the eastern seaboard in what is now the states of Delaware and Maryland (eastern section). Situated along the western border of the Powhatan confederacy, they were neighboured by the Mattaponi and the much larger Naticoke to the north, the Pamunkey to the east, the Powhatan (proper) to the south, and the Ozinie to the west. The Youghtanund (sometimes shown in contemporary records as Youghtamund) are one of the more mysterious tribes of the confederacy. Apart from their inclusion as one of the confederacy's six founding constituent members, very little has been discovered about them. According to some sources, the Youghtanund, Manskin, and Pamunkey were sister tribes, perhaps little more than villages with extremely close affiliations. They are listed by several early cartographers as living on 'the Island Field' - Guttins Island. As a tribe, the Youghtanund apparently disappear from maps precisely when the Manskin appear on subsequent maps, just across the river. Following the conclusion of the Second Anglo-Powhatan War in 1644/1645, the Youghtanund and Manskin identity became lost, as there was now no physical location or remaining peoples to which the names could be attached. The warriors were transported to Tangier Island in Chesapeake Bay, home to the Pokomoke tribe. Most subsequent maps (between 1650-1750) show the Manskin near or on Island Field. The Youghtanund are not mentioned on any map that shows the Manskin. Likewise, on later maps which show the Youghtanund, no mention is made of the Manskin. When viewed chronologically, one is forced to conclude that the Youghtanund are assimilated into the Manskin and cross the river to settle at Manskin Lodge, just up river from Pampatike on a slight peninsula called Manskin Neck. Pomiscatuck is weroance of the Youghtamund, and a master explorer and navigator. He is one of the few Powhatan to travel beyond the Monacan lands. Captain John Smith encounters the Powhatan and catalogues the confederacy's many sub-tribes. He gives a count of Indian warriors as thirty Youghtanund, thirty Mattaponi, and three hundred Pamunkey. He says there are seven hundred under Opechancanough, brother of Wa-Hun-Sen-A-Cawh and weroance of the Pamunkey. Pedro de Zuniga's map of villages in 1608 shows the Manskin next to the Youghtanund on the south bank of Totopotamoi Creek (which de Zuniga labels 'Manskint'), upstream and across from Cattytaco (Catachiptico). The Province of Maine (the far north-eastern corner of the modern USA) is founded in 1622, its name perhaps originating from the French province of the same name in New France. But it is not all plain sailing for the settlers of the British Colonies. 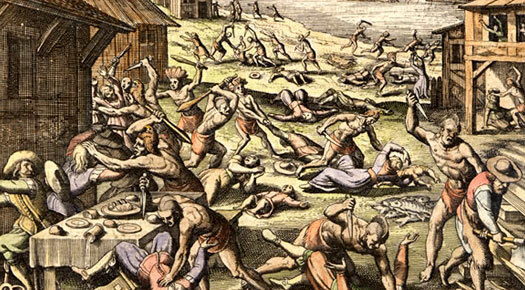 The Jamestown Massacre devastates the Jamestown Settlement and the Citie of Henricus on Good Friday, 22 March 1622. Natives of the Powhatan confederacy launch a surprise attack which leaves a quarter of the colony's population dead (347 people, although the Patawomeck refuse to take part in the massace). They are led in this Second Anglo-Powhatan War (1622-1644) by Opechancanough, now himself paramount chieftain of the Powhatan confederacy. 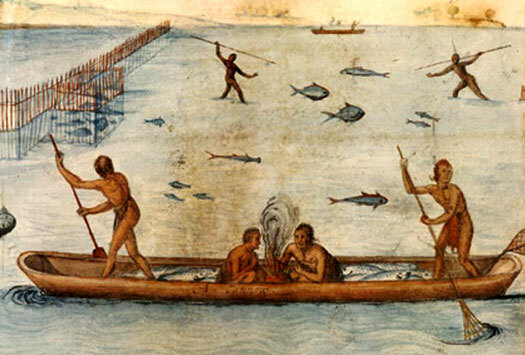 Following the death of Wa-Hun-Sen-A-Cawh in 1618, the Youghtanund are absorbed into the Manskin and then both Manskin and Pamunkey move their warriors to the Island Field (Guttin Isle) under Opechancanough's leadership. John Smith's 1607 figure of seven hundred warriors under Opechancanough may have been an exaggeration, as the only way he could have been anywhere near accurate would have been if these warriors had been Pamunkey. This warrior group are temporarily tagged as Manskin on maps because this is the tribe in closest proximity. Menmend (seemingly not a location or tribe but possibly a weroance?) on the Island Field had been attacked and captured in 1645 during the last stages of the war. This had been in retaliation for a massacre of the previous year. Following this the Youghtanund and Manskin identity becomes lost, as there is now no physical location or remaining peoples to which the names can be attached. The warriors have been transported to Tangier Island in Chesapeake Bay, home to the Pokomoke tribe. Most subsequent maps (between 1650-1750) still show the Manskin near or on Island Field. The Youghtanund are not mentioned on any map that shows the Manskin. Likewise, on later maps which show the Youghtanund, no mention is made of the Manskin. When viewed chronologically, one is forced to conclude that the Youghtanund are assimilated into the Manskin and cross the river to settle at Manskin Lodge, just up river from Pampatike on a slight peninsula called Manskin Neck. Many former member tribes of the Powhatan confederacy are extinct by 1722, having drifted away or merged with other remnant groups. The Rappahannock had already lost their reservation shortly after 1700, while the Chickahominy had lost theirs in 1718. These groups and the Nansemond fade from public view in the USA. Only the Pamunkey, Mattaponi, and an Eastern Shore group keep reservations, although their land constantly shrinks in size. The Manskin are not mentioned in any records after 1750, having become extinct.